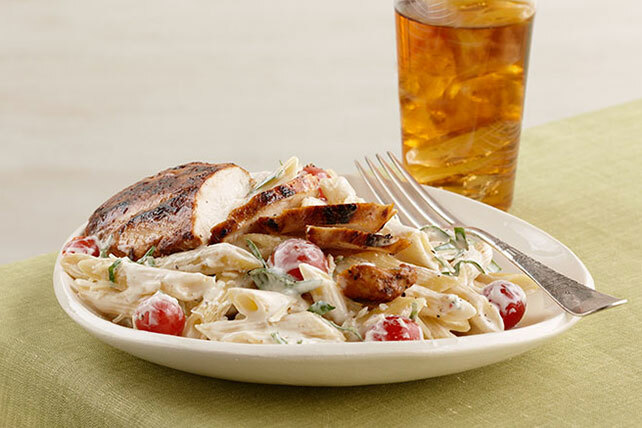 Watch our video to see how to make tasty Creamy Tomato-Basil Pasta with Chicken! This tomato-basil pasta entrée is ready to enjoy in just 30 minutes. Cook pasta as directed on package, omitting salt. Meanwhile, heat 2 Tbsp. dressing in large skillet on medium heat. Add chicken; cover. Cook 5 to 6 min. on each side or until done (165ºF). Remove chicken from skillet; cover to keep warm. Carefully wipe out skillet with paper towel. Serve with a crisp tossed green salad. Check out our shrimp variation Creamy Tomato-Basil Pasta with Shrimp.